A double live album and DVD spanning fourteen songs. The supremely talented vocalist Jorn Lande first came across my radar when I bought Brazen Abbot mastermind Nikolo Kotzev's 'Nostradamus' album. I bought that mostly due to the participation of two of my favourite male singers, Joe Lynn Turner and Glenn Hughes, ably supported by one of my favourite female artists, Alannah Myles, and the skilled ex-Rainbow singer Doogie White. In amongst this stellar cast, which also included Goran Edman, was Jorn Lande - some Norwegian singer I'd previously been unaware of. After hearing the 'Nostradamus' piece two things were clear - one, Jorn was bloody awesome, holding his own (or eclipsing in some parts) against his co-vocalists. Two, I needed to get some more of his stuff and fast! It turns out, as I'm sure any Jorn fan knows, he's been around - singing with bands like Ark, Beyond Twilight, Millennium and one of my personal favourites, The Snakes, where, alongside Bernie Marsden and Micky Moody, he recorded the best album Whitesnake never made, namely 'Once Bitten'. His 'Coverdale on steroids' style impressed me immensely and The Company Of Snakes attempts to redo almost all of the songs from 'Once Bitten' with the woefully inferior Stefan Berggren only proved Jorn's class. Aside from dalliances with Russell Allen and Masterplan, Jorn also has a strong solo career as a melodic metal artist. His second album 'Worldchanger' was a strong statement of intent, and Lande kept chipping away with excellent records like 'Out To Every Nation' and my personal favourite, 'The Duke'. A live album 'Jorn - Live In America' was released in 2007, but it depended on how much you liked Jorn's solo career as to how much you enjoyed it. Don't get me wrong, the performance was top notch, the sound was great, but the set list was a little bizarre. Spanning sixteen songs, the set included only four Jorn solo tracks, with the rest being made up of a Masterplan tune, a Snakes tune, a Beyond Twilight cover (all fair enough)... along with two Thin Lizzy covers, a Dio cover, a Deep Purple cover and a five song Whitesnake medley! Jorn performed them all superbly, but it was more like a tribute setlist than a solo artist performance. Since then Jorn has issued another two original solo albums, 'Lonely Are The Brave' and 'Spirit Black', along with a Dio tribute album. Personally I didn't much care for his last two records, there was plenty of heavy riffs and great vocals but the songs didn't stay with me like the ones from 'The Duke' - but that's by the by, plenty of others seem to have thoroughly enjoyed them and I'm a happy minority. Now his new live release looks to offer a more definitive Jorn concert experience. 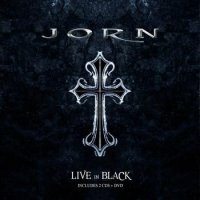 'Live In Black' offers a double live album and DVD spanning fourteen songs (plus the obligatory drum spot from Willy Bendiksen and pair of guitar solos from the dextrous Tore Moren and skilled Tor Erik Myhre) and the only cover is Thin Lizzy's 'Are You Ready' (which Jorn included on his 'The Duke' album anyway). The rest is hard and heavy stuff Jorn fans will know well - 'Tungur Knivur' from 'Worldchanger' is here, alongside recent cuts like 'Rock And Roll Angel' and 'Road Of The Cross' from 'Spirit Black'. There's nothing here from 'Out To Every Nation' or 'Starfire', but for the most part Jorn has covered all the bases solo wise. It's heaviest on selections from 'Lonely Are The Brave' and 'Spirit Black', so if those albums float your boat, this will too. Sound wise the production is all you could want from a Frontiers record. Vocally, Jorn is impeccable and his band are tight, the music heavy but melodic, the set list pleasing. If Jorn is somebody who you enjoy listening to, especially on the strength of his last two original albums, then 'Live In Black', offering both CD and DVD versions, should be marked as 'essential'.